Published on January 28, 2013 in analytics and general info. Closed Tags: Cape Cod real estate, Cape cod real estate sales, Cape Cod sales, Provincetown condos, Provincetown luxury homes, Provincetown real estate, Truro Real Estate, Wellfleet Real Estate. For a year filled with anxiety and trepidation, a polarizing presidential election and talk of falling off the fiscal cliff, the real estate market in many places started to purr like a fine tuned engine. Many cities and towns throughout the country experienced substantial increases in the number of sales as well as climbing prices. In some places such as the downtown Boston market, sales and prices were up as inventory fell to low levels not seen in many years. 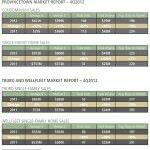 The news on the Outer Cape was as positive and the year-end sales reports surpassed what many in the industry expected.